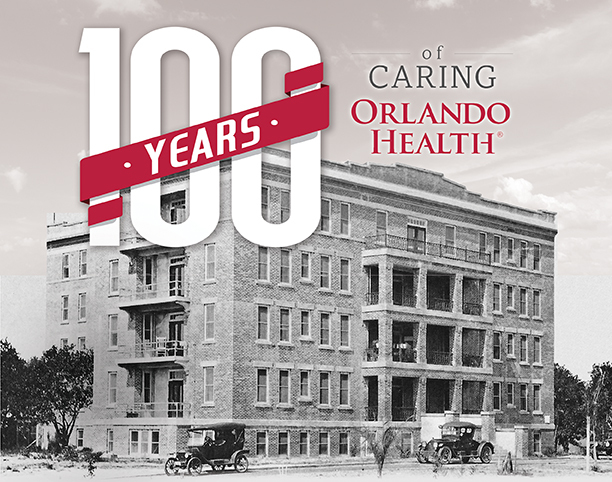 The Central Florida community celebrates Orlando Health’s 100 years of care. When Orange General Hospital opened its doors on November 5, 1918, Orlando and the nation were in the midst of historical events with great significance: World War I would end in just six days, the Spanish influenza pandemic already had killed more than a half million Americans and national elections brought sweeping congressional changes. 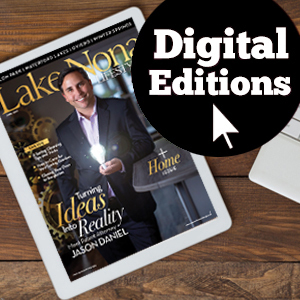 But few who celebrated the opening of the new hospital, including the local physicians and business leaders who had joined together to make it a reality, could have foreseen the historical significance of their actions. Over the decades, this 50-bed hospital would evolve into a leading healthcare system with multiple facilities and more than 2,400 beds, transforming healthcare in Central Florida and providing a century of caring for its residents. 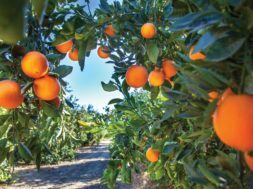 Situated on the site of today’s Orlando Health Orlando Regional Medical Center (ORMC), the four-story structure was surrounded by orange trees, a cow pasture and a dairy. Only two floors were built out, with separate wards for men and women on the first floor and private rooms on the second floor. With no gas or electricity, the hospital used candles and kerosene oil lamps at night, and sterile water had to be brought in. There was no such thing as air conditioning. The hospital’s first patient gave birth to a baby boy, named Seaborn, by candlelight. 1921: The first nursing class graduated. Within two years, the hospital had earned such a reputation that young women were eager to come to Orlando to train as nurses. The first students to enroll slept in vacant rooms in the hospital, with the first dormitory opening in 1922. Orlando Health’s nursing school continued until 1973. 1935: Major improvements were added, including a labor room, a delivery room and an operating room with stainless steel equipment. Previously, women delivered their babies in the same rooms used for surgery and emergency care. 1945: Orange General Hospital was one of only five hospitals in Florida approved for intern training by the American Medical Association. In 1951, it became one of Florida’s first approved teaching hospitals, with training in medicine, urology, obstetrics and gynecology, and surgery. 1951: The new north wing opened with air conditioning for some areas, including the intensive care unit, and surgical and labor suites. This welcome addition was in sharp contrast to the hospital’s early days when windows were always open, even during surgeries, and rooms were cooled by blowing a fan over ice-filled washtubs. 1965: Orlando Health was the site of the first successful open-heart surgery in Central Florida, followed by the opening of the first coronary care unit in Central Florida — one of only a few in the country. The 1960s saw several more medical milestones, including the area’s first cardiac catheterization, pacemaker insertion and ultrasound, and the first mammography in Florida. 1975: One of only six of its kind in Florida, the Neonatal Intensive Care Unit (NICU) opened. At that time, Orlando Health had the second-largest number of births in the state — 4,000 annually. During the 1980s, golf legend Arnold Palmer toured the NICU and pledged his support for a new children’s hospital that would later bear his name. 1983: Orlando Health became home to the region’s only Level One Trauma Center, the highest level of trauma care, and only the second in the state at the time. In 1985, the Air Care Team helicopter rescue service was established, serving a 26-county area. 1985: Sand Lake Hospital, now Orlando Health Dr. P. Phillips Hospital, opened — built in response to the large population and tourist growth taking place in southwest Orange County. 1989: Orlando Health Arnold Palmer Hospital for Children & Women opened. In 2006, the name was changed to Orlando Health Arnold Palmer Hospital for Children. 1991: The original hospital’s 73-year-old buildings were torn down to make way for a $66 million expansion of the Orlando Health downtown campus. Soon after, the Orlando Cancer Center opened, serving 3,000 patients with 40,000 outpatient visits in its first year. The campus expansion continued over the years, including the 2015 addition of the North Tower at Orlando Health ORMC. 1992: South Seminole Hospital joined Orlando Health, the organization’s first venture into Seminole County. 1995: South Lake Hospital affiliated with Orlando Health, bringing the network of care into another Central Florida county. 2006: Orlando Health Winnie Palmer Hospital for Women & Babies opened, continuing the legacy of the Palmer family. Today, Orlando Health Winnie Palmer delivers more than 13,000 babies each year and more than 1,400 receive care in the Alexander Center for Neonatology. 2012: Health Central Hospital joined Orlando Health, expanding the footprint to the west Orange County area. 2016: Orlando Health was thrust in the spotlight following the mass shooting at the nearby PULSE nightclub that killed 49 people. By noon on June 12, surgeons had operated on 26 victims, and all of the 35 who were treated survived. 2018: Three new Orlando Health Emergency Room and Medical Pavilion locations opened in growing communities in the Leesburg, Clermont and Winter Garden areas, with another set to open soon in Kissimmee. 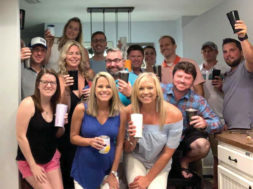 Plans are underway for Lake Mary and SE Orlando locations.